OptiMix is a patented baffle design that optimizes the mixing performance of glass-lined reactors by integrating three baffles on the vessel wall. 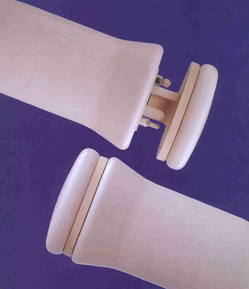 OptiMix baffles are lined with 3009 glass for superior corrosion resistance. OptiMix baffles are also available in QVF borosilicate glass reactor designs. Eliminates the need for top entry baffles, freeing up an additional nozzle for process use. The high performance, flange-mounted BeaverTail baffle features no-entry installation and removal. The flange-mounted design reduces the possibility of leaks through gaskets or packing, since only one gasket is required for a seal. Our UniTip Type DR temperature sensor is standard on all BeaverTail Baffles. The innovative combination dip pipe/baffle provides three functions in one piece of equipment. Baffling, sampling,and temperature measurement can all be performed from a single nozzle, freeing up additional nozzles for other process piping. Baffling -The BeaverTail Baffle design creates a superior mixing environment even in the most demanding process conditions. It surpasses finger baffle performance at any liquid level. 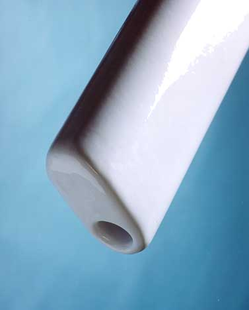 Sampling - The dip pipe portion of the baffle enables samples to be taken during vessel operation, eliminating the hassle of having to stop production to obtain samples. In addition, when samples are taken during the mixing process, a more accurate specimen can be captured. Temperature Measurement - A DDPS SVR removable cartridge type temperature sensor (100Ω RTD) is optional and housed in the left tube. Because there is no metal thermowell or gasket exposed, maintenance is stress free. 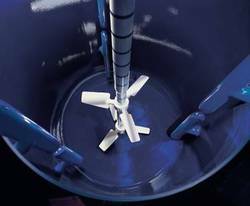 The temperature sensor can be removed or replaced while the vessel is still in service. The dip pipe/baffle is flange-mounted for easy and inexpensive installation without having to enter the vessel and cause unwanted delays in production. Completely lined with DDPS 3009 glass, the unit has optimum corrosion resistance and meets cGMP requirements for cleaning. Installation requires an 8” nozzle or larger. A bellows, expansion joint or flexible hose must be used in conjunction with the dip pipe/baffle to compensate for the thermal expansion of the inner pipe. The ability to take a truly representative sample with no need to depressurize the vessel or lose the insert atmosphere makes this product ideal for chemical and pharmaceutical processes where contamination is usually an issue during sampling. The sampling baffle can effectively reduce batch time and cost by significantly reducing sampling time (sample can be taken and rinsed clean in under 3 minutes), leaving to higher productivity and product yield.